A Deloitte Access Economics report commissioned in 2015 by Bayer with input from Macular Disease Foundation Australia estimates 72,000 Australians are living with diabetic macular oedema (DME), a serious eye disease caused by diabetes, which can lead to permanent vision loss and blindness. 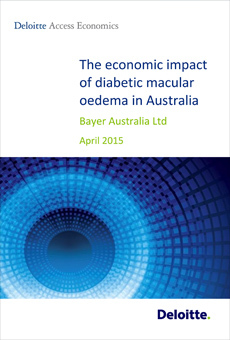 The Economic Impact of Diabetic Macular Oedema in Australia highlights the stark reality: The number of people at risk of blindness from DME will grow dramatically in the next 15 years from 72,000 to 102,000 people - that's 102,000 people at risk of blindness. The entire indirect financial and wellbeing costs associated with DME are set to amount to approximately $2.07 billion in 2015. The report shows that the workforce will be hit hard with costs of approximately $570 million due to productivity losses from lower workforce participation, absenteeism and premature death. There is also a huge emotional cost to the individual, their family and carers. Diabetes and its complications, including diabetic macular oedema is one of today’s biggest public health challenges, and of major concern to the Foundation. Also of concern, is that only half of those living with diabetes undergo the recommended two-yearly eye examination, even though early detection and timely treatment can prevent vision loss.